Geoffrey Witte’s work spans more than four decades. 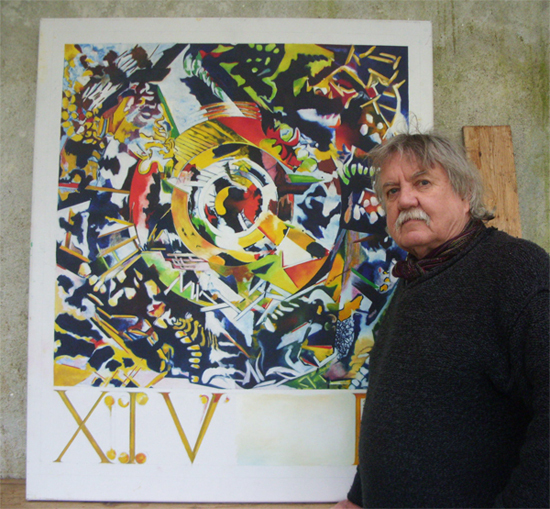 A painter, sculptor, and printmaker, he has worked in many countries throughout the world having works in private collections world wide. Witte’s professional career began in New York in the early 60’s where he was an active participant and was friend and associate to many of the well known artists. Through Robert Rauschenberg he met Marcel Duchamp in ‘66. As personal friend of Andy Warhol, Witte had contact with the world of film and glamour. Yet, throughout he maintained a personal approach and originality which is readily apparent both in painting and sculpture. The intensity of Witte’s work develops from his method and approach, each picture or sculpture - large or small has a unique history and process, subject matter is drawn from a specific theme, which is developed through complex mathematical deductions and modifications, with subjective references to aspects of science, nature, and technology - yet the finished work stands essentially regardless of the complexity of its evolvement - that his work not only has a background of long experience but also each piece and picture has undergone its own particular specific development, establishes a state where, works can be seen to change. The more they are seem or that there is always more to see in the work. In conclusion, Witte’s painting is very much about painting itself - colour, brush work, counterpoint in perspective, depth of field, and the formal layout. Asked if he thought of his work as abstract he answered, “Everything I do is drawn from nature, from careful considerations of nature. I always know the specific origination, but that may only be apparent to me, and perhaps is not important to know, or in fact in many cases, would only confuse. So for me my work is not abstract. Definitely ‘recognizable’ but not to be confused by recognition, which would make the work literal. I want painting to be essentially about painting, and sculpture to be about sculpture”.